I'm an outgoing student of Mechanical engineering from the 2016 batch of AVCE. Recently i was selected as one of the few students to participate in the Honda Awards function organized by Southern Honda, Nagercoil for Technical engineering experts on 8th June, 2016. Few students from the other engineering colleges also participated in event. We had a contest to design automobiles. I'm extremely glad to be adjudged the best performer among the participants. 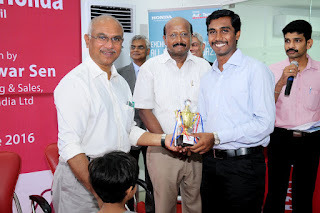 I also received the “Best Achiever Award 2016” from Dr. J. Devaprasath MBBS, MS, FAMS (Managing Trustee of Jeyasekharn Hospital) in the presence of Mr.Janeswara Sen, HR Honda Motors and Mr. Stalin, Founder of Southern Honda. The experience I gained in the on road and off road car projects undertaken by AVCE students along with my final year project on "E-Bike" provided me the enthusiasm and courage to take part in the challenging program. I am quite thankful to the management and staff members at AVCE for their valuable suggestions and excellent motivation. I am very much proud to be a student of Annai Vailankanni College of Engineering. I also wish everyone to utilize the golden opportunities provided at AVCE.